Last year, I missed Circumspecte’s maiden and second edition of Sisterhood Matters and I had made a mental note to attend the 2019 edition. 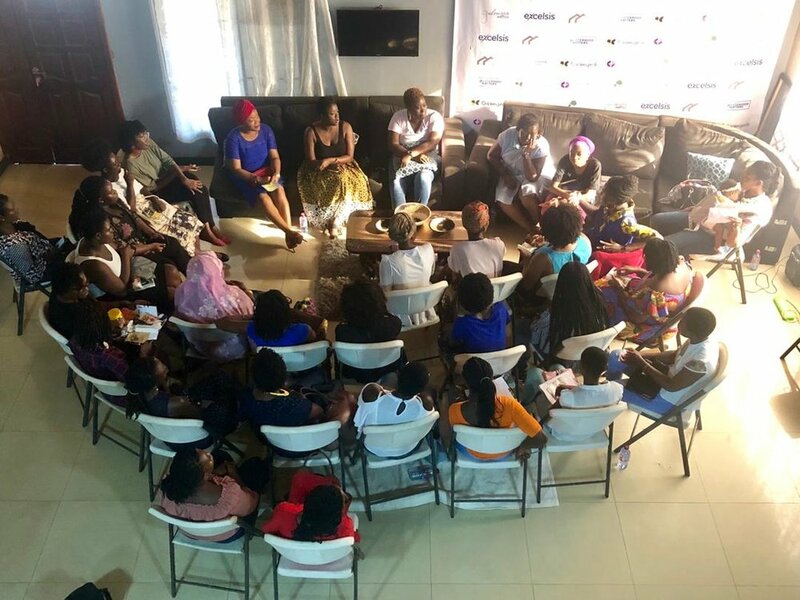 I had followed the social media campaign when Jemila Abdulai, founder of Circumspecte started having conversation with different women on an array of issues. I was like yep! This is it. This is the way to go. Now you all know, I am bias when it comes to my side. (Why wouldn’t i be?) We have a number of social limitations that set us back as women and not enough avenues to have those conversations. So imagine my delight, when Jemila reached out to me to host this year’s edition for the 6th of April! I was over the moon but also (typical me) appropriately scared of public speaking. But since it’s been one of my new mottos to always say YES to new opportunities without giving room to doubt, I went for it! But let’s talk about inspiration! Oh boy where do i start? From value-added workshops, to inspiring conversations, bonding activities, hair and beauty stations! Sisterhood Matters lived up to it expectations and beyond . There were many observations from bits i saw, pre and post event period that are important to note. So here are my takeaways from Sisterhood Matters! The gift of volunteering : There is something rare about finding people who believe in a cause and working hard to see it through. I met people like Eno Abena Effah, Efuwa Quansah, Beatrice Brew, Lutfata Sung Bawiera and Annatu Abdulaiand Akua Adwapa Donkor (who flew in from London by the way!) and a few other people like Binta Etim who donated a part of their craft to make the event successful. These ladies plus many others made sure the social media for the event was consistent and exciting. There was also efficient coordination on the ground in making sure, the set-up, props and all the elements needed were in place and ready to go. Now this is poignant because growing up, I hardly participated in any initiatives that required volunteering. There weren’t any I heard of and it just wasn’t something I remember doing, during high school or even at university level. There is very little volunteering culture. I have to commend that it is great to see Circumspecte create the space that enables volunteering! Partnerships : Circumspecte had some pretty amazing partners who not only provided services during the event but facilitated some amazing giveaways! What’s interesting about these partnerships are the fact that most of them are small-scale businesses as well. Green Basket , Excelsis, Packageware, Soronoko Academy, Nabia beads just to name a few. Now if you run a small-scale business, you’re probably thinking it’s unadvisable to overstretch your capabilities and offer freebies. But yo! this was an eye-opener for me in terms creating awareness about your brand. Through the giveaway segment, more and more women got to hear about new businesses and services they were willing to try out! If you’re thinking of organizing an event on any scale, as daunting as it may seem, please reach out to people or organizations that may be aligned with your cause or might be interested in taking on some of your costs. It is truly a win win situation if done well. They get great publicity and you get some valuable helpers. Checkout the businesses and entrepreneurs that got on board below! Communication : Listen! Communication will never not be enough when you’re organizing any event no matter how big or small, especially when there are going to be a few moving parts. I must commend the Circumspecte team in being so thorough communicating every detail of the program to all speakers before hand. We were all sent updates about every segment and the format it would take. This was important to me as the host because i had a lot of information to work with and the detailed nature of the program was a life-saver. I have had to be a host at events were i had limited information. That can be a big stressor, thinking on your feet, keeping your cool and not coming off flustered. So event organizers, please communicate. Communicate beforehand, communicate minutes before the event, leave room for unforeseen delays, and equally interesting things to fall back on when things aren’t going as planned or when things slightly changed. I can’t wait to see what Circumspecte has in store for women, moving forward. I am also hoping more women leaders are inspired to pursue their dreams and ideas knowing now, that it is possible and it is valid.